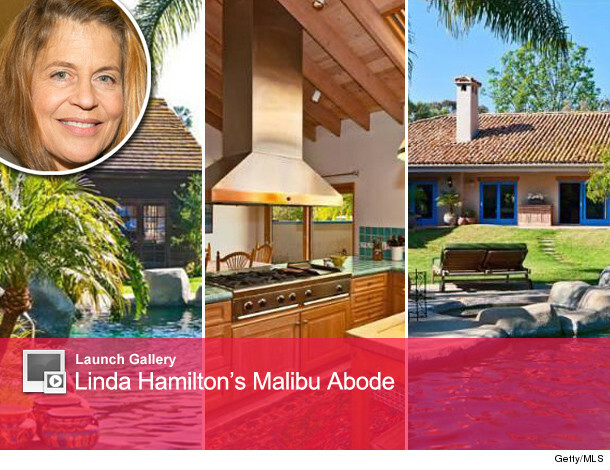 Linda Hamilton Sells Scenic Malibu Abode! "Terminator" star Linda Hamilton is saying “Hasta la vista, baby” to her Malibu estate – she just sold her pricey pad for $4 million! The 56-year-old actress is taking a bit of hit though (that is, $1.5 million), because she originally listed the house for $5.495 million back in February. This is the first time the house has been on the market since 1995, back when she was still in a relationship with director James Cameron (the two divorced in 1999). The 4,754 square-foot six bedroom home, boasts soaring ceilings, Spanish tiles, a screening room, gym and a giant detached guest house. And even though the private property comes with three different beach entrances – you really don’t need to leave the backyard for some R&R! The entire surrounding area of the home is covered in luscious green landscapes, gardens, patios and a sparkling pool with a cascading waterfall. Talk about living large! Click “Launch Gallery” above to see all the pics of Linda’s lavish pad! Multi-Million Dollar Baby -- Hilary Swank Lists Pacific Palisades Home! Country Singer Selling Colossal Countryside Compound!